Busy weather, originally uploaded by captainjay. 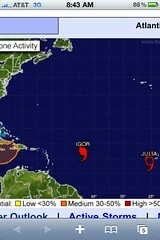 Well, it's getting busy out in the Atlantic again. Category 4 Igor and Tropical Storm Julia heading west but both are predicted to turn northwest and miss the Virgin Islands. I hope they're right. We leave tomorrow for a trip to WV so we're going to leave all the shutters up just in case. Thankfully we have great neighbors that will be keeping an eye on the place and friends that we can call if needed. Hope these latest storms miss you entirely! Bon voyage!